When the television was repaired, an external insulation antenna terminal was made because the electric shock was not prevented, and the leak breaker was not operated carelessly. There are quite a lot of parts connected directly from 100V in the television when the television is repaired, and the antenna terminal might be hit there carelessly. Then, will you have worked the leak breaker? Moreover, have not you gotten an electric shock feeling after the antenna terminal and the earth of the chassis in the television part when repairing? When the charge part of the television is touched if it is not a place where the repaired place was insulated even if the insulation antenna terminal is used, it gets an electric shock. It cannot be said it is safe if putting down a rug on the floor or not working on the square cushion. If these are not used, the voltage ratio should put separates transformer (insulation transformer) couple 1 in the power supply side of the television. Please see the page of "Electric shock and earth" and "Insulation transformer" in detail. 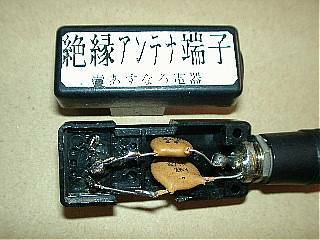 The characteristic impedance made it by using it because the thing that F type [tsusensuwa] and F type plug of 75Ω attach was at hand. I think that former thing was a thing to examine whether the power supply of BS has come to the place of the BS antenna. I think that I can do even if it installs and the capacitor is installed in it on the way of the coaxial cable if there is no suitable thing even by a small printed wiring board. It makes as compactly as possible to prevent the wave obstruction directly or I think that you should shield the whole (electromagnetic shielding) of the electric wave from the broadcasting station. It doesn't shield it in this photograph. There are a lot of numbers of distribution, and when electric field strength in the antenna terminal is low, it is necessary to shield it in the strong electric field region. The wick line on the antenna side is connected with the television side mutually with the capacitor of 150PF, and the outside of the same ax is connected mutually with the capacitor of 390PF. I think that there only have to be as much as 500V though I used the thing of the resisting pressure 2kV. I think that suitably and capacity is good if it is not extremely far apart. If it is a thing of 50-1000PF, it might be unquestionable for the capacitor. Even if this is installed, it gets an electric shock when it is a too big value.